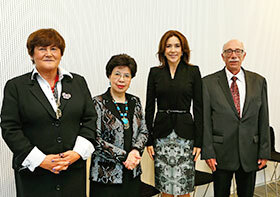 (From left to right) Zsuzsanna Jakab, WHO Regional Director for Europe, Dr Margaret Chan, Director-General of WHO, HRH Crown Princess Mary of Denmark and Dr Daniel Reynders, the outgoing Executive President of the Regional Committee for Europe. The 64th session of the WHO Regional Committee for Europe (RC64) was opened by Dr Daniel Reynders of Belgium, the outgoing Executive President of the Regional Committee, and began with an address by Her Royal Highness Crown Princess Mary of Denmark. Rapporteur: Dr Alex Leventhal of Israel. He underlined the importance of the proposed European action plans for food and nutrition and for vaccines, as well as the strategy for child and adolescent health, to be discussed in the coming days. The Crown Princess appealed for accelerated progress towards the MDGs, and for the future development framework to include universal health coverage, noncommunicable diseases (NCDs) and sexual and reproductive health and rights. Among the items on RC64’s agenda, the Crown Princess particularly mentioned those that related to her her interest in child and adolescent health, such as the strategy on that subject, the European Vaccine Action Plan and its focus on equal access to immunization, and the continuing obesity epidemic among children addressed in the food and nutrition action plan. She concluded her address by underlining her continuing commitment to promoting and advocating health, and called on participants to share their experience and vision to advance the health agenda, up to and beyond the 2015 deadline for the MDGs. Reflecting on the five years since she had taken office in 2010, the Regional Director noted that several factors – the health burden of NCDs and its determinants, economic recession and austerity, reduced public health functions, poorer access to services and growing health inequities – mean that health must be placed higher on the political agenda. Health 2020 was developed as a response to these challenges, renewing and unifying the policy environment in the WHO European Region. Looking forward over the next 5 years, WHO/Europe would assist in consolidating and fully implementing Health 2020 at the regional, subregional and country levels. “What we want to achieve is more equity in health and closer links between health and sustainable development. Our aim will be ‘better health for Europe: more equitable and sustainable’,” said the Regional Director. Ms Jakab detailed many collective achievements, and the ways forward, on a number of health issues. Substantial progress was made in reducing under-5 mortality (MDG 4), with mortality rates falling in the Caucasus and central Asia from 49 per 1000 live births in 2005 to 36 per 1000 live births in 2012. The new child and adolescent health strategy 2015–2020 identified priority areas for action. Of the 190 million people aged under 18 in the Region, an estimated 18 million had experienced sexual abuse; 44 million, physical abuse, and 55 million, mental abuse. The proposed European action plan on child maltreatment provided guidance on intersectoral approaches to prevention. The European action plan on NCD prevention and control had resulted in many more Member States’ having national integrated policies on NCDs. Recent assessments of NCD management, however, had identified continuing concerns, including: providing universal access to essential medicines for hypertension, diabetes and cancer; low or no utilization of services; low rates of cardiovascular risk assessment and inappropriate use of cancer screening. The European Region had the highest number of parties (50) to the WHO Framework Convention on Tobacco Control (FCTC), but also the highest rate of adult smoking. The Ashgabat Declaration on the Prevention and Control of Noncommunicable Diseases, endorsed by Member States in 2013, worked towards making the Region tobacco free. An estimated 350 000 new tuberculosis cases occurred in the Region each year. Treatment-enrolment rates rose from 63% to 96% between 2012 and 2013, but treatment-success rates were less satisfactory and still varied widely. As the European Action Plan for HIV/AIDS 2012–2015 was implemented, testing and counselling services were increasingly available; good progress was made in eliminating mother-to-child transmission and the number of people on antiretroviral treatment considerably increased. Nevertheless, HIV cases continued to increase: by 7% since 2010. For the first time data were available on antimicrobial resistance and antibiotic consumption in several countries outside the European Union (EU). Outbreaks and the continued transmission of measles and rubella threatened the goal of elimination by 2015, and high-quality surveillance and high population immunity were needed to ensure global poliomyelitis eradication. The proposed European Vaccine Action Plan emphasized the importance of equitable access to high-quality, safe, affordable vaccines and immunization services. WHO/Europe supported the global response to the Ebola outbreak in West Africa; 3 staff had already been deployed, and 23 were preparing for future deployment. The Region had scaled up operations in response to several humanitarian and natural crises, notably flooding in the Balkans, and supported refugees from the Syrian Arab Republic and internally displaced people in Ukraine. Renewing the focus on primary health care, spelling out the consequences of economic crisis on health, promoting universal health coverage, and facilitating learning and building capacity in health financing through flagship courses were key areas of WHO/Europe’s work to strengthen health systems. WHO/Europe had continuously improved its information and analytical resources by, for example, establishing an annual autumn school on health information and evidence for policy-making. It had increased the range and depth of its work with existing partners, including the European Commission and countries holding the Presidency of the Council of the European Union; with civil society; with new and evolving types of partnerships; and with Member States through such means as the development of country cooperation strategies (CCSs). WHO/Europe enhanced its communications to improve the availability and accessibility of information and to make governance processes more transparent. It used social media to reach new audiences. Existing geographically dispersed offices (GDOs) in Germany, Italy and Spain had contributed substantially to WHO/Europe’s work, and planned GDOs in Kazakhstan, the Russian Federation and Turkey would further increase its technical capacity. Representatives expressed their continuing appreciation for the work, support and guidance of WHO in the European Region, under the strong leadership of Zsuzsanna Jakab, WHO Regional Director for Europe. In its capacity as President of the Council of the European Union, Italy spoke on behalf of all EU Member States, and explained its concern about inequalities in the Region and access to health services, specifically referring to discrimination on the basis of gender and sexual orientation. The representative also reiterated the EU’s support for the WHO reform process, and called for further progress in WHO’s relations with non-State actors. The representative of Tajikistan thanked WHO/Europe for its continuing support, particularly in developing a strategy and roadmap to improve women and children’s health in the country. Germany identified the increase in cases of multidrug-resistant tuberculosis in the Region as a major concern, and welcomed WHO/Europe’s emphasis on strengthening health systems, referring to the current Ebola outbreak as further evidence of the need for strong systems. The Turkish representative stressed the importance of health security, particularly in light of Turkey’s position “on the doorstep of Europe”. Referring to the CCS being developed between Turkey and WHO, the representative emphasized the importance of Member States’ taking an active role in the organization and management of WHO activities. Iceland thanked WHO/Europe for its goal of and work for better health for the people of Europe. Referring to health developments in the country, the representative from the Russian Federation spoke of enhancements in preventive medicine and improvements to medicine distribution. The country was committed to addressing NCDs at a global level, and invited experts to the opening of the GDO on NCDs in Moscow later in 2014, as an opportunity to exchange views on the issue. France expressed concern about continuing health inequities, calling access to care “a distant dream for many”. The representative reiterated France’s commitment to the environment and health process, as shown by its hosting of a high-level WHO meeting on transport and health in Paris in April 2014 and plans to host the Conference of the Parties to the United Nations Framework Convention on Climate Change (COP21) in December 2015. The representative of Spain described the national strategy for health promotion and disease prevention, which focused on risk factors and promoted health throughout the life-course. Spain would host the fifth meeting of the European Environment and Health Ministerial Board in 2015. The Ebola outbreak was a reminder of the importance of good surveillance systems, and Europe’s responsibility to help the countries affected. Poland also praised WHO’s role in fighting the Ebola epidemic, welcomed WHO/Europe’s work on NCDs and expressed support for the forthcoming WHO/Food and Agriculture Organization of the United Nations (FAO) joint Second International Conference on Nutrition, to be held in Rome in November. The representative of Greece thanked the Regional Director and Director-General for their work in implementing Health 2020 and developing the post-2015 development agenda. Greece also called for a clear framework for WHO’s work with non-State actors. The representative of Norway highlighted the importance of adolescent health in its own right in the strategy on child and adolescent health. He also referred to new WHO estimates on the effects of air pollution on health, and Norway’s work with other Member States, including France, to draft a proposed World Health Assembly resolution on air pollution. The representative of the Republic of Moldova explained the importance of the presence of a country office to the health ministry’s work. Speaking on behalf of the South-eastern Europe Health Network (SEEHN), the representative from the former Yugoslav Republic of Macedonia described SEEHN’s development since its founding and its striving towards a whole-of-government approach in its work. The establishment of centres of excellence on such issues as communicable diseases and mental health had enhanced collaboration between members, illustrated by the subregional response to the floods in the Balkans. Portugal explained that its health goals were aligned to Health 2020, and referred to that day’s signing of a CCS with WHO. The representative also thanked the Regional Director for her report and sound leadership. The representative from Kazakhstan described how the country was developing primary health care in remote regions to improve fair and timely access to health care for all. She also described improvements in the main indicators for mother and child health. Mr Heimo Laakkonen, Director, United Nations Population Fund Regional Office for Eastern Europe and Central Asia, referred to the progress made and WHO’s part in achieving the health-related MDGs. He underlined that sexual and reproductive rights were at the core of sustainable development, and called for the promotion of a post-2015 development framework “where everyone counts, including the most vulnerable”. Ministers and heads of delegations participated in a lunch meeting to discuss progress and accelerated efforts to reach the health-related MDGs, as well the dialogues and consultations taking place to establish post-2015 health goals. It was widely understood that the broader post-2015 development agenda would be based on the premise of sustainable development, for which health was a precondition, an outcome and an indicator of success. As an initial suggestion for future development goals, the Open Working Group on Sustainable Development Goals (OWG) had submitted “Proposed goal 3: Attain healthy life for all at all ages”. OWG recognized that universal health coverage was central to sustainable development. Identifying ways to deliver the new goals was part of the process of developing them. United Nations (UN) country teams in the WHO European Region were leading national dialogues on that until the end of the year. Health ministries were requested to keep their national representatives to the UN General Assembly in New York, taking place from 16 September to 1 October 2014, well informed and briefed on health-sector discussions. The briefing provided a forum in which to discuss the public health aspects of migration, explain WHO/Europe’s work and support to Member States, and identify future focus areas. It was attended by 7 Member States, as well as representatives of nongovernmental organizations (NGOs). Economic crises, natural disasters, armed conflict and food insecurity had displaced millions of people and thus threatened their health. Migrants may be more exposed to avoidable health issues including inequities, unhealthy lifestyles, infections, limited access to care, social stigmatization and mental and physical health challenges. Through the Public Health Aspects of Migration in Europe (PHAME) project, for example, WHO/Europe worked closely with Member States to strengthen the health sector’s preparedness for and public health capacity to better address emergency-related migration. Issues raised at the briefing included provision of assistance and health screening on arrival, management of large influxes of migrants, overcrowding in arrival centres, ways to tackle gender-based violence, the challenges of undocumented migrants, their vaccination status, and the economic burden of providing services. There was widespread agreement on the commitment to provide health care and support to migrants, and the need for a common approach to this shared challenge. Dr Ray Busuttil, Chairperson of the Twenty-first SCRC and Executive President of RC64, reported on the SCRC’s work in 2013–2014. Its 5 regular sessions had focused on preparing for RC64 and finding ways to make the SCRC’s work more transparent and to encourage the active participation of all Member States. The SCRC deferred 3 agenda items proposed by the Secretariat for a later RC session: a partnership strategy, a country strategy and a health information framework. The SCRC’s subgroup on governance had developed proposals for a more transparent, objective system for nominating members of the Executive Board and SCRC; it had been pilot-tested and would be further refined by the next SCRC. The subgroup also made proposals on the presentation of resolutions and on enhancing the involvement of NGOs in RC sessions, which were approved by the wider group. The SCRC subgroup on Health 2020 implementation advised on how to engage with other sectors and civil society to promote whole-of-government, whole-of-society and health-in-all-policies approaches, and on the development of tools, targets and indicators to support implementation. Referring to the SCRC’s oversight of WHO/Europe’s performance and budget, Dr Busuttil expressed its concern about pockets of poverty (underfunding) in some programme areas, such as NCDs. Following the SCRC’s advice, however, a bottom-up approach was being used to develop the 2016–2017 budget, ensuring that it would have a more solid foundation than earlier budgets. It would also represent the priorities of the Region, according to the SCRC Chair. Acting for, representing and advising the RC, at each of its regular sessions the SCRC reviewed and developed the agenda items for RC64, ensuring that they were in line with Health 2020 and consistent with the global agenda. In a fourth consecutive annual report on WHO reform, WHO Director-General Dr Margaret Chan and the WHO Regional Director for Europe described progress and the various implications for the European Region, including the programme budget, strategic budget allocation and framework for engagement with non-State actors. The report was part of the series realizing a commitment to increased transparency on the topic of reform that had been made during RC61. It indicated significant progress over the past 12 months in moving WHO’s reform agenda forward, particularly as to the flexibility, transparency and predictability of financing. The Regional Director explained that increased dialogue with Member States on WHO finances would improve trust in the Secretariat. A significant programmatic reform in the principles for planning and budgeting included a bottom-up planning methodology that incorporated extensive front-end planning with countries to identify priorities and a careful review of regional resources. In governance reform, clear advances were made in providing electronic access to governing-body meetings, better managing draft resolutions and using a new electronic voting system to elect the Director-General. These efforts and others comprised a step towards increased transparency for all Member States. Good progress was made in managerial reform on the issues of financing dialogue, strategic allocation of budget space and financing of administrative and management costs, increasing predictability and transparency for Member States. Member States detailed both concerns about and praise for the reforms, with comments addressing the need to work on relations with non-State actors, to increase interaction with NGOs and academe, and to take an interactive approach in dealing with feedback from Member States. In response to Member States’ statements, the Director General explained that any change would require discipline by Member States, as they drove the Organization. Dr Hans Troedsson, WHO Assistant Director-General for General Management, described the programme budget for 2016–2017. He explained recent enhancements, including more focused technical cooperation through the bottom-up identification of priorities at the country level, a clearer reflection of the roles and responsibilities of each of WHO’s three levels and better alignment of work through category and programme-area networks. Various Member States provided feedback on the discussions. Italy, speaking on behalf of the EU Member States, expressed their continued support for the sustained effort, while simultaneously urging further progress and clarity on all issues related to reform. Other delegations supported the speaker’s request that WHO improve results-based management and costing outputs, with outcome indicators that would make the Secretariat accountable. Other important insights included the need for flexibility to meet potential outbreak and crisis demands, and to ensure that adequate attention and funds were dedicated to environment and health. In a bilateral morning meeting, the Ministry of Health of Portugal and WHO signed a CCS, setting the vision for creating synergy and alignment between WHO’s leadership priorities and Portugal’s national health policies, strategies and plans for the period 2015–2020. This was the first CCS to be signed by an EU Member State. On Sunday, 14 September, 22 Member States discussed how WHO should engage with non-State actors, which include NGOs, private-sector entities, philanthropic foundations and academic institutions. Member States requested the meeting to discuss the draft framework for engagement with non-State actors, first discussed at the 2014 World Health Assembly and opened for written consultation during the summer. They wished to settle their remaining questions and prepare a common position for the discussion of the issue by the Executive Board in January 2015. It was agreed that the outcome of the informal meeting would be presented to RC64 during its debate on the topic. At a press conference held on 11 September, the WHO Regional Director for Europe had addressed 15 Danish and international journalists and explained the key plans and strategies to be discussed and agreed by Member States during RC64, highlighting the progress report on the implementation of Health 2020; proposed five-year action plans for food and nutrition, vaccines and the prevention of child maltreatment; and the new strategy for child and adolescent health. With other members of WHO/Europe’s executive management team, the Regional Director had responded to a range of questions on how to measure Health 2020 implementation, where vaccine hesitance was most prevalent, how the food and nutrition action plan addressed the food industry and scientific studies of diet, and how to prevent child maltreatment. Representatives of 14 NGOs had attended a briefing session on 14 September to acquaint themselves with key issues on the RC64 agenda, side events during the week and their participation. In total, 40 civil-society organizations were attending RC64, including those in official relations with WHO and observers.